Hurricane Irma strengthened into a powerful Category 4 storm on Monday forcing Florida to be declared a state of emergency. 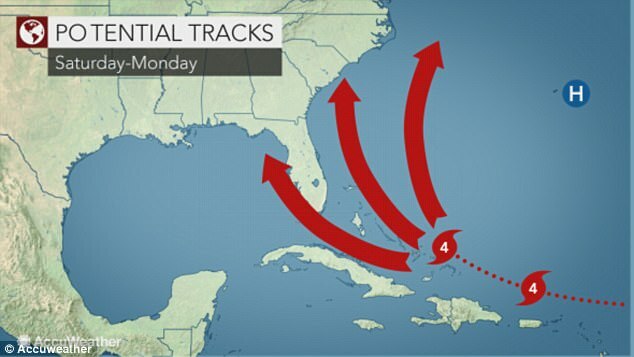 Florida Governor Rick Scott declared the state of emergency for all 67 counties in the state on Monday after some forecasts showed the powerful storm could be headed for the East Coast. Meteorologists had earlier predicted the storm posed a ‘serious threat’ to the US. ‘Hurricane Irma is a major and life-threatening storm and Florida must be prepared. I have continued to be briefed by the Florida Division of Emergency Management on Hurricane Irma and current forecast models have Florida in Irma’s path – potentially impacting millions of Floridians,’ Scott said. Irma grew into a Category 4 storm on Monday as it approached the northeastern Caribbean with winds of 140 mph. In comparison, Hurricane Harvey had winds of 130 mph when it made landfall in Texas last week. It is forecast to begin buffeting the region on Tuesday and the US National Hurricane Center said additional strengthening was expected. Emergency officials warned that the storm could dump up to 10 inches of rain, unleash landslides and dangerous flash floods and generate waves of up to 23 feet as the storm drew closer. Hurricane watches were posted on Sunday for parts of the Caribbean including Antigua and Barbuda, Anguilla, Monserrat, St Kitts and Nevis, St Martin, Guadeloupe and the British Virgin Islands. The US National Hurricane Center said the center of the storm could near that region late Tuesday and that islands farther north, including the U.S. Virgin Islands and Puerto Rico, should monitor the progress of the storm and be prepared for Irma possibly to head their direction. ‘Irma is a serious threat for the Caribbean islands and United States,’ AccuWeather Lead Long-Range Meteorologist Paul Pastelok said. It is still unclear what path Irma will take as it inches closer to the US. Right now, meteorologists believe there are about three paths the storm could take. It could move out into the Atlantic and completely bi-pass the US, it could hit the Carolinas or it could go south and graze Cuba before hitting the Gulf of Mexico, around the Florida panhandle.